Claim Settlement Ratio is one of the benchmark which may be used to ascertain the kind of service one can expect from the Insurance companies operating in the market. Although Claim Settlement Ratio is not the only parameter on which an Insurer should be judged but it is one of the important aspect which should not be ignored. The recent changes to the Section 45 of IRDAI (Insurance Regulatory and Development Authority of India) rules has also clarified the concerns of the policyholders and provided a fair market for the Insurers as well as the Insured. 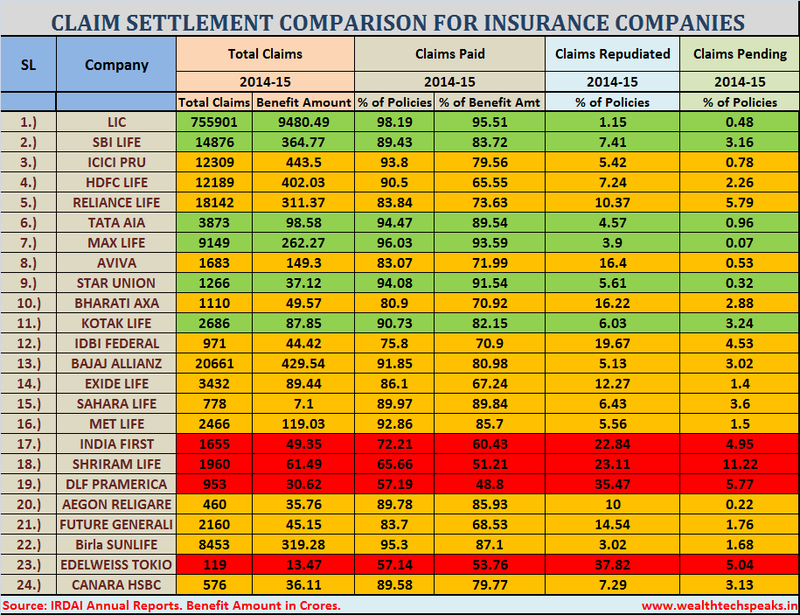 However, this data is just related to Claim Settlement Record of the respective companies and does not necessarily mean that Company with the best Claim Settlement Record is providing the best Insurance Plans in the market. Going forward, with amendments in the IRDAI guidelines companies are compelled to comply with the same which in turn will ensure that claims are settled sooner and without any hassles. 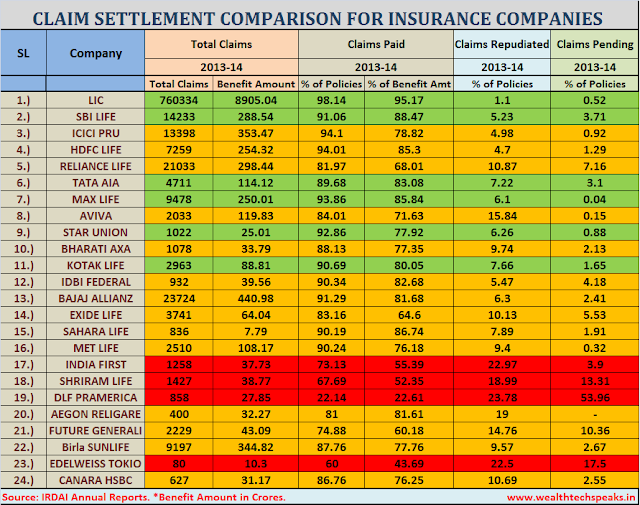 Claim Settlement Ratio may be defined as the ratio of claims settled by the Insurance Company out of the total claims received during a particular period. The remainder of claims are either pending for decision with the Insurer or have been rejected on grounds of misrepresentation, fraud or any other valid reason as prescribed by IRDAI. 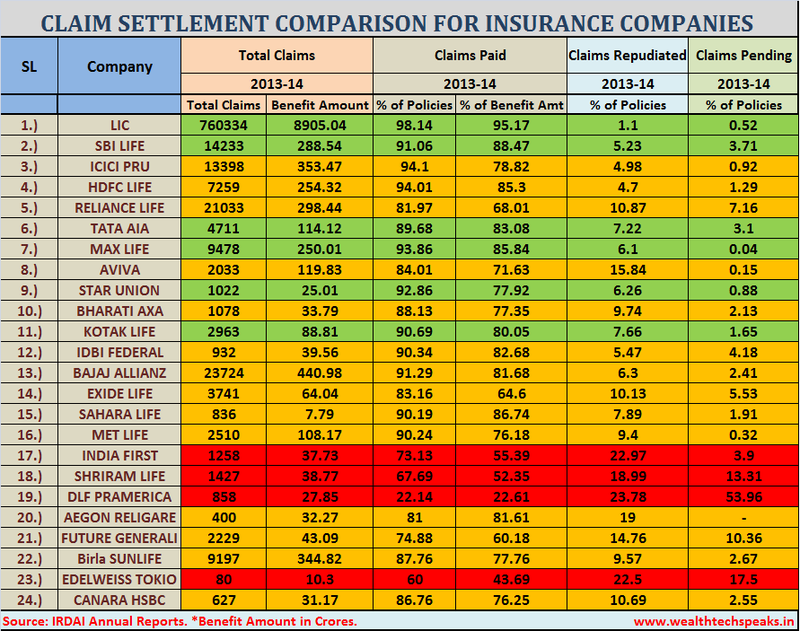 In this post I have compared the performance of the Insurance companies for last 2 years. I have not only considered the Claim Settlement Ratio in terms of number of Policies but also in terms of Benefit Amount disbursed. 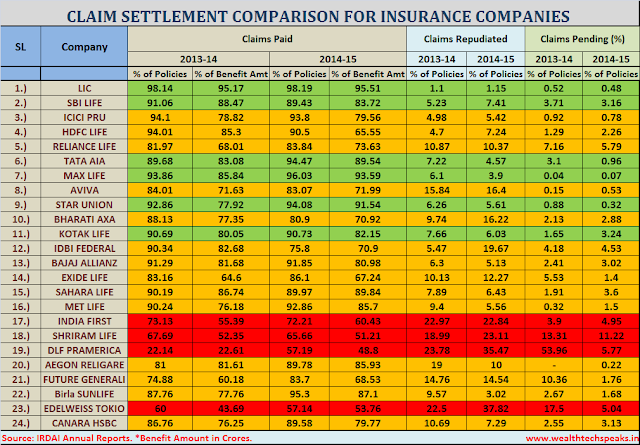 Insurance Companies who have settled more than 85% of the claims policy wise and have disbursed benefit amount in excess of 80% in the last 2 years have been marked in green, Insurance companies who managed to Settle Claims below 75% either in terms of total claims made or total benefits disbursed have been marked in Red and the rest are demarcated in Yellow. Clearly, the ones marked in the Green have performed well and do instill a lot of trust among the existing as well as potential customers. While the rest need some improvements in order to provide better support to the customers. We find a lot of claims repudiated in the previous year largely due to the amendments made to rules which I have discussed previously. Insurance Companies are being strict with the norms and compliant guidelines. Customers also need to ensure that the do not misrepresent, impersonate or adopt any fraudulent practices while purchasing any policy as it may lead to claims being rejected and unnecessary legal hassles. Companies who have settled more than 1000 claims have only been considered for the top ranks. 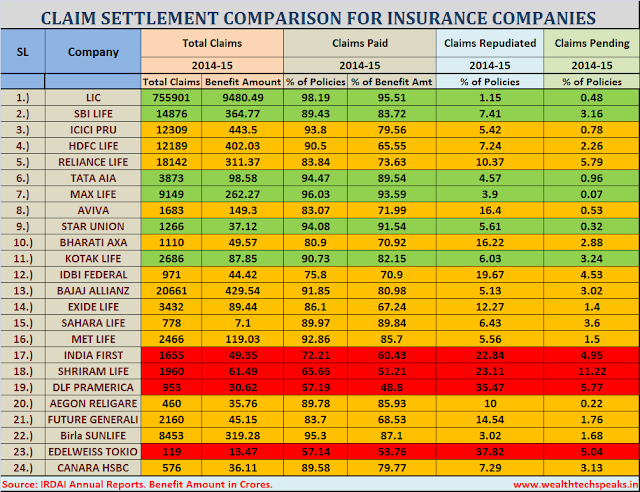 Please Note that Claim Settlement Ratio is an indicative figure purely providing insight about the manner in which the company is settling the claims. It does not investigate the viability or the benefits offered in any Policy issued by the Insurance Companies. It also does not suggest or determine superiority of any policy or company in terms of benefits offered, return on investment or any other parameters as such. Customers/Buyers should conduct a thorough research and consult their respective Financial Advisers before investing. I have put in three different charts as it would have been very confusing if everything is clubbed in a single chart. Two charts show the performance of the Insurance Companies in the last two years and last chart compares them.